Drumming sessions are a fun way to facilitate teamwork and get the group to act as 1 unit. This activity is normally used as a break away session during a conference or meeting. Drumming team building sessions are very popular for break away sessions or just a way to get the team to work together is a fun and creative way. 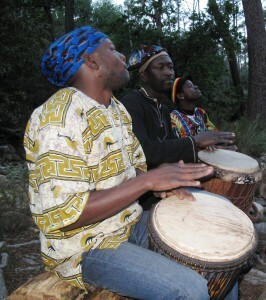 We have a group of drumming instructors available to go to the venue of your choice. We will supply each person with a drum and the fun will begin. Our instructors will show you how to get different sounds out of your drum and as the session goes one, you will learn how to play different beats individually and as a group. This activity is perfect for a breakaway session and is enjoyed by all!